The title says it all. Empires will clash in high-definition this September! 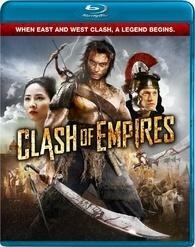 In an early announcement to retailers, Image Entertainment is working on 'Clash of Empires' for Blu-ray on September 6. A clash of swords is like a call to arms. But a clash of empires will summon much, much more! A narrative that travels through unknown lands towards nameless peril, 'Clash of Empires' is an exhilarating story of brave deeds from distant times. 'Clash of Empires' features an international cast and incredible action sequences headed by renowned Hong Kong stunt choreographer Chan Man Ching (member of the Jackie Chan Stuntman Team). A colossal film in the epic tradition, 'Clash of Empires' is a thrilling combination of romance and betrayal…of adventure and danger! You can find the latest specs for 'Clash of Empires' linked from our Blu-ray Release Schedule, where it's indexed under September 6.